Miami FC is catching fire at the right time of the season, its flames kindled by stacks upon stacks of hundred dollar bills from the bank account of owner Riccardo Silva. In the Spring Season, Miami did not get the formula right, but they quickly adjusted. Learning from your mistakes is a hallmark of success, and Miami FC demonstrated that by moving on from some big name signings who flopped, while going after some of the league’s better players. Lofty transfer fees and big salaries bolstered the roster with the likes of Poku, Michael Lahoud, Richie Ryan, Gabriel Farfan, and most recently and shockingly, New York Cosmos vice-captain Hunter Freeman. After finishing at the bottom of the table in the Spring Season, Miami FC now trails only the Cosmos in the Fall table. The turnaround has not only been on the field. Just as importantly, Miami’s attendance has trended upward as well. After debuting to a very respectable crowd of 10,156 for their April 8th opener, Miami saw attendances decline to 1,229 and 1,837 for their last two home matches of the Spring. Their five game Spring average was 3764 across the first five games including that 10,000+ debut, and without it the other four averaged 2,166. Fall attendance is off to a much better start. 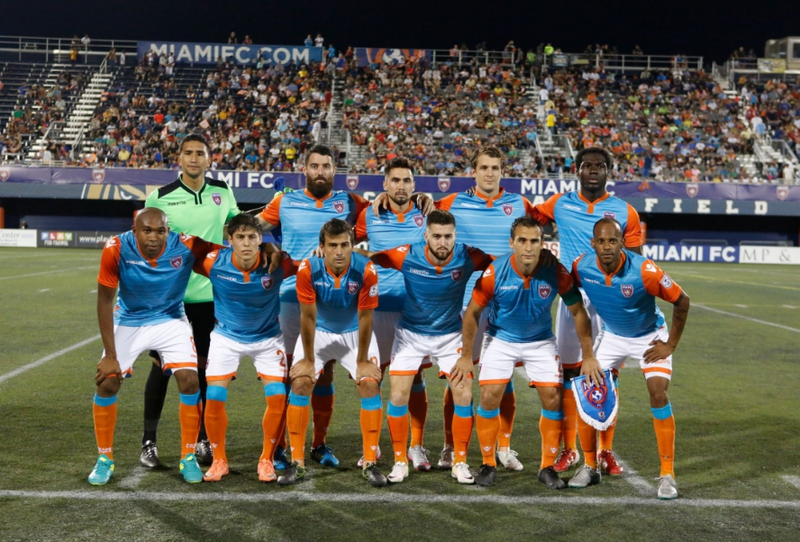 Miami FC is averaging 6,118 for its first six home matches. In its three matches since August, Miami has averaged 7,928. As for its off the field momentum, Miami CEO Sean Flynn attributed the success to persistent efforts to reach out to the community. “We continue to introduce our brand to the market, tell the story of who we are, and what we want to be, which is the soccer hub of Miami, the center of our soccer community. This town bleeds soccer, and I think our brand is starting to catch on,” he told the Herald. For now, Miami FC has the town to themselves, even if they share the TV market with the historic Fort Lauderdale Strikers. As the Strikers and Rayo OKC have struggled from a business perspective this year, Miami FC’s positive momentum shows what can happen when a NASL franchise is backed by a committed, wealthy owner who takes advantage of the league’s business model. At this rate, fans across the league who jeer “F— the Cosmos”, may have to revise their slogan. Miami FC has poached three players from the Cosmos roster this season, convincing them to take their talents to South Beach. With those moves, Miami FC signaled their intent in the league, like a new inmate punching out the biggest dude in the prison yard. Miami FC is the new bully on the NASL block. The Future Of US Club Soccer At A Crossroads: Part Three – Could 2018 Look Like 2010 When It Comes to Division 2 Soccer in the United States?